Automatically cross-couples two batteries to one or multiple loads for highest DC system reliability. 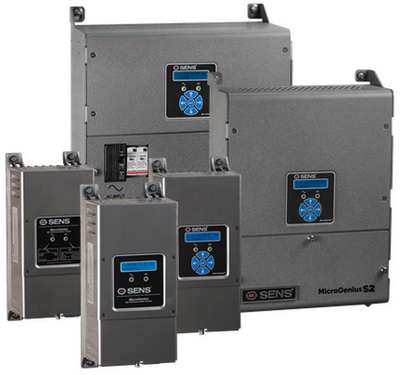 SENS Best Battery Selectors (BBS) deliver power from two different batteries to one or two loads in environments requiring very high availability. In normal operation, current flows through the BBS from both batteries. But, if one battery is weak or has failed, power automatically flows to the load from the other battery. The best battery selector prevents parallel connection of two batteries so that a bad battery does not cause the failure of the other one. Three models are available offering 1250 amp, 2500 amp and 6400 amp peak current ratings to suit a wide range of loads in applications ranging from 12 volts nominal to 120 volts nominal. For continuous loads, the BBS-800, BBS-1600 and BBS-4800 will support 45 Amps, 50 Amps and 150 Amps respectively of continuous current at any voltage up to 120 volts. Both SENS BBS models are fully solid state, without any moving parts or control electronics. De-rated diodes, transient suppressors, and oversized head sinks assure reliable operation. All SENS BBS models are IBC seismically certified to an Sds value of 2.50g. A Best Battery Selector (BBS) is a device that is increasingly used in engine starting environments that demand extremely high reliability. Many specifications now call for two sets of batteries to be coupled to a single engine. If one set of batteries is weak or dead, the other set of batteries can still start the engine. A BBS couples these two sets of batteries to a single engine, automatically using whatever current is available from both battery sets to start the engine, but at the same time isolating the batteries so that one bad battery set does not bring the other one down. How does a BBS work? A properly engineered Best Battery Selector (“BBS”) consists of two large diodes, specialized heat sinks, and voltage surge protection assembled and mounted in a metal enclosure. During normal operation with two good sets of batteries, the diodes are “on” and they deliver the cranking current to the starters. When one set of batteries gets weak or fails, its diode is “off” because it is no longer delivering current to the starter, but it is blocking current supplied by the good battery from flowing in the reverse direction into the bad battery. Is the BBS designed for negative or positive ground systems? Why should I use a BBS? If I use your BBS, can I use one battery charger to charge both sets of batteries? No. Each set of batteries needs its own charger, so that it can be independent and isolated from the other set of batteries. If only one charger is used, this defeats the isolation because the charger would be connecting the two batteries together. How do I know what BBS to use? SENS offers three sizes of BBS: The BBS-800 is rated for 30-second rolling current up to 1,600 Amps at -18C and 1,075 Amps at +50C, the BBS-1600 is rated for 30-second rolling current up to 3,200 Amps at -18C and 2,150 Amps at +50C, and the BBS-4800 up to 7,150 Amps at -18C and 4,950 Amps at +50C. Select a BBS with a current rating high enough to handle the cranking current drawn by your starters. Why are the diodes on heatsinks? The diodes can carry very large peak currents during worst-case conditions in a motor cranking cycle. The heatsinks protect the diodes from overheating when they’re carrying these large cranking currents. Why aren’t there any fans blowing air on the heatsinks? Fans are not needed, because the heatsinks have been sized large enough for convection cooling. This is an added reliability feature because there are no fans to fail. Why is there a wire connected from the chassis to the door? This is a ground strap. It is a safety device to ensure that the hinged door is properly grounded. Does a BBS need to be UL listed? No. Like all SENS products, the BBS-800, BBS-1600 and BBS-4800 are designed for safety. The common types of UL listings for battery chargers (UL 1012, UL 1236) are not applicable, and there is no UL standard dedicated to BBS products. Why doesn’t your BBS have any breakers or fuses? The BBS electrical design is very simple, because it contains diodes that are passive devices. Breakers and fuses are not needed in this type of product, and this also means there’s no risk of decreased reliability due to false trips. Why aren’t there any cables or terminals on the heatsinks? Where do I connect our DC cables? Because system requirements vary widely, SENS BBS products provide a wide range of options for the installer to connect DC cables. A common way to install a BBS is to use 4/0AWG or similar flexible cables, terminated with either 1-hole or 2-hole ring lugs, and the lugs are bolted to the BBS heatsinks using the locking hardware that’s provided with the BBS. Multiple DC cables may be installed along the heatsink channels to increase current carrying capability. What size wires can I connect to the heatsinks? The SENS BBS-4800 has conduit holes and adequate space on both sides of the heatsinks for bending radius for up to 350MCM cables, or double 4/0AWG cables. The SENS BBS-800 and BBS-1600 have conduit holes and adequate space and bending radius for up to 4/0 AWG cables. What’s the voltage rating on your BBS? SENS BBS products are rated up to 120VDC nominal. This means that the BBS may be used for systems with nominal battery voltages including 12V, 24V, 32V, 48V, 120V and other special voltages up to 120V. The 120VDC nominal rating is not a maximum voltage; actual 120VDC battery system voltages may be as high as 148VDC and this is acceptable for SENS BBS products. What are the maintenance requirements for the BBS? If properly installed, the BBS requires no maintenance. In environments that are subject to high vibration, corrosion, or other elements that may degrade electrical equipment, it’s recommended to periodically check the integrity of the DC cable connections at the heatsinks. If I use your BBS, how do I connect my alternator into the system? If an alternator is used, it should be connected to only one set of batteries, not both. This will maintain isolation between the two batteries. What if I have two alternators in my system? This is an acceptable system design. In the case of two alternators, connect “Alternator A” to “Battery A” and “Alternator B” to “Battery B”. This will maintain isolation between the two batteries.